A sacred ascent to the noetic Mount Tabor with the eyewitness of the Divine Majesty, the Holy Apostle Peter, as our guide. “We were with Him on the Holy Mount” (II St. Peter 1:18). The Holy Apostle Peter, as a genuine spiritual Shepherd, addresses himself to Christians in his God-inspired epistles, in order to draw up their minds to great heights, to another noetic Tabor, so that they, also, might become “eyewitnesses of the majesty” of Christ our Savior. The method employed by the Chief Apostle in drawing us up is genuinely pastoral. He knows that he is addressing himself to people who are still “novices and imperfect” and who “have not been vouchsafed noetic illumination of the heart”; consequently, the constant banishment of lethe (forgetfulness) and ignorance from their minds is needed, by means of remembrance and knowledge in Christ, so that, shaking off indolence, they might embark on the sacred ascent. Living and active Faith purifies the hearts of the simple and “insignificant” believers no less than the hearts of the prominent and notable, and unites them with Christ our Savior. “Since Christians are born of one and the same Father, even God; and from one and the same Mother, the Church; and from one and the same womb, the holy Font, they are, for this reason, all one kind, and receive one and the same form,” and, in consequence, they are “equally precious” according to the Faith. “It increases and grows in Christians who are virtuous, perfect, and of noble conduct; but it decreases inversely and diminishes in Christians of little faith, who have a worldly and base mentality." But how, O Holy Apostle Peter, are we to rise above our worldly and base mentality, that the purifying, illuminating, and deifying Faith might increase in us? The Chief Apostle now puts us in remembrance of the revelatory experience he was vouchsafed on Mount Tabor and, at the same time, impels us yet higher. 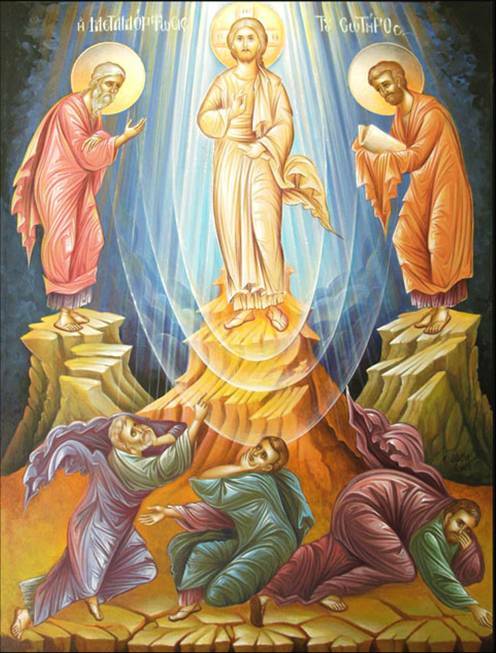 “We were eyewitnesses of his majesty,” “being with Him on the holy mount.” We saw the raiment of our Master Christ shining like light in the Divine Transfiguration! We saw our Savior in His Divine glory, “covered with light as with a garment”! Hence, now “the word of prophecy is more sure.” And “insofar as you are novices and imperfect, and have not been vouchsafed noetic illumination in your hearts,” it is good and beneficial to take heed of words of prophecy. However, it must be increased and augmented! Until when, O Chief Apostle, shall we take heed of the imperfect “word of prophecy”? Then, “He, the Giver of the Law and Lord of the Prophets, Who inspired the Prophets with the prophesies—He, I say, dwells in your hearts by Grace and His Divine Light; and He mystically teaches you not only the Mystery of the Incarnate OEconomy, but also other mystical and secret dogmas of higher theology, to the extent that they can be comprehended; and He gives you inner assurance and makes you established believers! Our Shepherd, Who speaks of the mysteries and loves His children, has already drawn us up to the peak and summit of Tabor! And how, O Chief Apostle, is this strange-sounding and supernatural illumination of the Divine Comforter brought about in our hearts? How are we to start, and what follows next? And how is this sacred activity brought to completion? “Secondly,” he continues, “through the acquisition of all of the virtues—as much the practical ones as the theoretic—and, indeed, principally by means of noetic and unceasing prayer meditated in the heart with a mournful spirit. Through all of these things, “and especially through mourning and tears, the heart and all of the inner man are purified of predispositions and passions, as much the bodily—such as gluttony, hedonism, carnality, and the rest—as the spiritual, namely arrogance, vainglory, unbelief, cowardice, and the rest. In the meantime, “the more illumined” the Christian “becomes by his works of light, and the more he approaches the true and first Light, God”— being continuously purified “of every sin” through partaking of the Immaculate Mysteries “with fear and a contrite heart”—, he thereby all the more completes the arduous stage of purifying ascent, whereupon “his mind has returned—and not only his mind to itself through noetic restoration in the heart, but it has also returned all of the other powers of the soul to itself, and has rendered them noetic, too, in a way. “Come, let us ascend the Lord’s mountain!” The purifying climb is arduous. The spiritual darkness of lethe, ignorance, and indolence, “of the thrice-gloomy darkness of ignorance,” deters the soul from Divine ascents. The Chief of the Apostles exhorts us: let us make a start! Let us have “sincere minds,” such that they might be “stirred up” and begin the godly ascent.